Washington, D.C. - October 24, 2009 - Today, the best horses and riders from the hunter divisions at the Washington International Horse Show competed for the top prize in the $15,000 WIHS Hunter Classic Derby. After two rounds of competition, it was Scott Stewart, of Ocala, FL, who dominated the event by finishing first with Way Cool and second with Declaration. The champions from each of the hunter divisions were invited to compete in today's two-round derby. The six horse and rider combinations receiving the highest scores in the first round were invited back for a second round over a handy course. 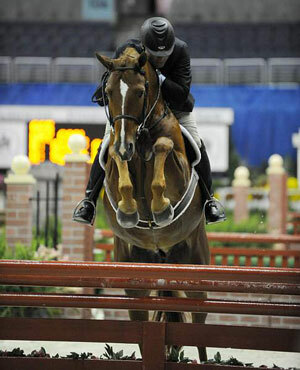 After the first round, Stewart was in the lead with Declaration, owned by Fashion Farm of New York, NY, with a score of 91.3. In the handy round, they had difficulty at the trot jump and received a score of 78.3, for a two-round score of 169.3, which dropped them into the second place. Samantha Schaefer, in second place after the first round with a score of 88.3, had a costly rub at the trot jump with Bishonen, owned by Marianna Bishop Wade of Louisa, VA, resulting in a second-round score of 70.6 for a total of 158.9, which dropped them into fifth place. Jennifer Alfano and Jersey Boy, owned by SBS Farms of Buffalo, NY, were lying fourth with a score of 84.3 after round one, but a very strong handy round with inside turns earned them 82.3, for a total of 166.6, which held up for the third place. After the first round, Stewart and Way Cool were ranked third with a score of 86.3. Knowing he would have a second chance with Declaration as the first ranked horse, he went all out on the handy course with Way Cool. The pair took all the harder options and the gamble paid off with a score of 84.6 and a two-round total of 170.9, enought to win the class and garner Stewart his second victory in two years. "It feels great, it was a valiant effort," said Stewart. "They were both so good. I almost thought 'Send them home and be done,' [after their earlier wins in the week] because sometimes you want to quit while you're ahead. They are both very green, so I didn't want to leave on a bad note. We went for it and it was good, so it was worth it." Stewart was pleased at how Way Cool, a seven-year-old first-year hunter, handled today's competition. "During the handy round I went for it," he explained. "He rode great for never having done anything like this before. I was thrilled because he's really green, but he's a really good jumper and really careful. I didn't know how he would feel about all the bushes against the side, but he was perfect." Stewart sent his horses home for a day to get turned out after they finished competing in the professional divisions earlier in thge week. With a win and a second, it proved to be a plan that worked. "I think it helped that they got to go out in a paddock," said Stewart. "They felt exactly the way they did all week. I don't think Way Cool came close to even touching a jump all week." 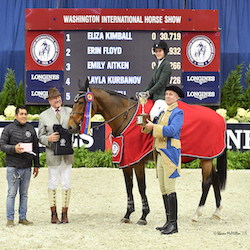 Photo Credit: Scott Stewart had the top score of 170.9 points with Way Cool to win the $15,000 WIHS Hunter Classic Derby for the second year in a row. Photo By: Rebecca Walton/PMG. Photograph may be used only in relation to this PMG press release.